For many Vegans, meeting protein requirements continues to be the greatest challenge. With meats, dairy, and eggs off the table as viable sources of protein, finding alternative plant based protein sources is vital. Many vegan protein sources aren’t perfect sources of protein, making it crucial to combine protein sources to replicate a complete protein as best as possible. This vegan quinoa protein salad packs a winning, muscle building combination of quinoa, peas, beans, and nuts. In addition to the high protein content, this salad packs tons of antioxidants and vitamins from the kale and tomatoes and is high in dietary fiber. This salad is easy to make and can be served room temperature or cold, which makes it a perfect make ahead meal for easy lunches on the go. The homemade lemon vinaigrette dressing makes it delicious and light tasting, perfect for a summer lunch! 1. Cook the quinoa according to the directions on the package and let it cool, fluffing it with a fork every few minutes while cooling. 2. While the quinoa is cooking, steam the peas and kale. Let them cool and set aside. 3. 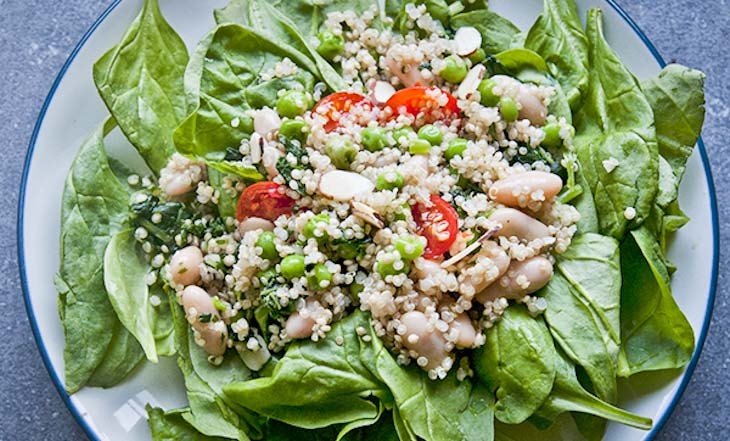 Toss the quinoa with the peas, beans, kale, tomatoes and nuts. Set aside. 4. Whisk together the balsamic vinegar, Dijon mustard, the juice and zest from 1 lemon and 2 tablespoons of olive oil and pour over the salad, gently tossing to coat. Serve at room temperature over mixed greens.